There are certain albums which sum up their time very well and can bring back, summon up, moments and feelings and emotions, good or bad; the full significance of music for many is that it can do this. The fall of 1985 was, however, a kind of non-time for me, plunked in the yellow-lockered halls of the wing of Sheridan College where us young women were learning to type, girls just out of high school who were still being formed and shaped, fickle and forgetful. The year was waning and the warm glow of summer was gone, but here are Simple Minds, to remind us of what things were like only a few months before. Oh how time passes! How high on self-congratulation and general vaguely smug rightness filled the post-Live Aid period, a time when raising awareness and curiosity about how the world worked and really was was trumped by a sense that a huge event and some optimism would salve/solve things, that actual facts and details would somehow sort themselves out. I don’t think there’s an album that sums this whole feeling up more than Once Upon A Time, itself a product of misguided optimism. After touring in support of Sparkle In The Rain, the band – now minus their secret weapon, bassist Derek Forbes, who joined old Simple Minds drummer Brian McGee in Propaganda – commenced to record this. Jim Kerr has by now met, married and had a child with Chrissie Hynde, and this album is full of the exuberance of this love, an exuberance that does turn into hot air after a while. Some of that hot air was to push him to record this for a definite aim of cracking North America, the heartland of the US in particular, and so Jimmy Iovine and Bob Clearmountain produced it, with big washes of synth, a woman – Robin Clark, ex-singer with Chic – brought in to give their music soul, passion and honesty, while poor Charlie Burchill has to struggle most of the time to have his guitar heard above all this. Kerr’s I-Have-Seen-The-Promised-Land vocal style, meanwhile, is so self-satisfied as to make you think that it’s Jim Kerr & The Simple Minds and punk never really did happen. It is a odd thing to describe an album as coldly warm, but that’s what this sounds like; what with Kerr dropping in “God only knows” and “new day rising” and other clichés, and ending two songs with “take me away” as if the rapture of his existence is more important than writing coherent lyrics. Even on “I Wish You Were Here” (which may be about Ian Curtis), the calmest Kerr gets on this can-you-hear-me-in-the-back stadium rawk, he and the band aren’t really struck enough by the loss; in the haze of the summer and the heat of his romantic bliss a great deal of what made Simple Minds buzz is gone. And so this this in part the fall of 1985 – big expansive and ultimately nearly impersonal* music, nothing that really sticks closely or touches finely, but blusters and pounds away and congratulates itself on “Come A Long Way” – a song about time again, the metaphysics of which boil down to…well, I’m not entirely sure what. Kerr ends up sounding like a man who thinks he knows what’s what and is more than ready to impart his knowledge to us, but it was written in haste (the whole album seems to be done in haste) and is clumsy at best. How on earth could he have written “See this race is wrong/Come see, this race is right/See millions of years pass with no end in sight” otherwise? 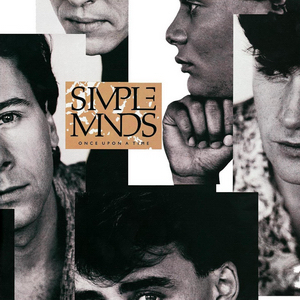 For the first time Simple Minds have made an album worse than U2, not better, and it will take them some time to fix that; whether they cared or not I don’t know. Once Upon A Time was a big hit in the US, so the producers’ job was done, Kerr appeared – just himself, not the band – on the cover of Spin, and I had to start looking elsewhere for something a bit more immediate and recognizably human, whether it was Easy Pieces by Lloyd Cole and The Commotions, Psychocandy by The Jesus and Mary Chain, or heck, even that song I always heard while having my (in retrospect) not very good bagel and cream cheese in the cafeteria, “She Sells Sanctuary” by The Cult. Kerr wants you to somehow “Sanctify Yourself” by being “a part of me” – Simple Minds tries to do gospel and it fails; Ian Astbury testifies and makes more sense. Even the Cocteau Twins’ Tiny Dynamine/Echoes In A Shallow Bay makes more sense, come to think of it. But Simple Minds’ attempt to get Iowa to love them is way behind all of these, and is far worse than “Don’t You Forget About Me” which is ultimately what they are really remembered for, in terms of 1985. Next up: Quiet storms, longevity and how to be cool. *I find it rather cold that The Pretenders, not Chrissie Hynde, are thanked in the acknowledgements section. It smacks of a man who is in love but really is married to the game, who makes a big show of being in love without actually doing things to prove he’s a good husband. Hynde’s response to this, The Pretenders’ 1986 album Get Close, is an answer record to this one, and much better, too.